We’re now printing the reverse side of the sheet, meaning that we’re over the half way point in the printing of LABYRINTH SUBLIME: THE INSIDE PASSAGE. 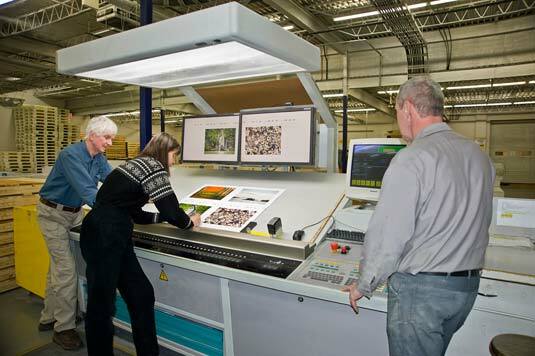 Having been on press continuously for nearly a week, round-the-clock with short cat-naps, we were offered and gratefully accepted a more realistic 6:00 am to 10:00 p.m. schedule for the balance of the printing. This allows us a full night without hourly wake-up calls. Having enjoyed a most welcomed seven hours of sleep last night, we have more spring in our steps (and minds) this morning. We are on a high today, having completed the 12-hour day-shift with fine progress. Several images are printed with such sensitively that you almost could believe them to be three-dimensional rather than printed ink on paper. We’ve just started the evening shift, which now for us will be just four-hours in length. Here are more photos which we’ve taken these past couple of days with comments about the lithography process. The image below with Pat and Gerald Schellenberg, our evening shift head pressman, shows the top view of the ManRolland 900 press. On this huge machine (which can print sheets of paper up to 50" in width) there are individual inking unit for each colour. You can also see the coloured ink supply pipes to the right coming from the ceiling down to the ink fountains on the press. Starting at the feeder end of the press (behind Gerald’s back), are the black, then cyan, followed by magenta and, in the foreground, the yellow ink fountains. 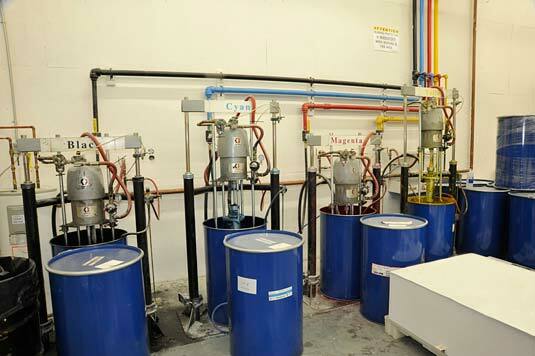 Within each inking unit are two large cylinders. One is mounted with a printing plate, the other with a rubber blanket. As mentioned in our last email, the printing plate picks up the ink, which is then transferred onto the rubber blanket. The blanket then transfers the ink to the paper. Here’s a closer view of the yellow ink in the fountain. Drums of ink are inserted with an agitator and pump, and connected to the ink feeder lines for transport to the presses. 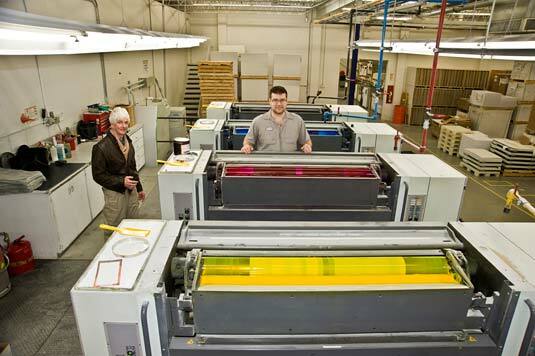 Our press receives black and cyan inks, both lightfast, from this station. The magenta and yellow inks for our book are special, and are not from this main feed. 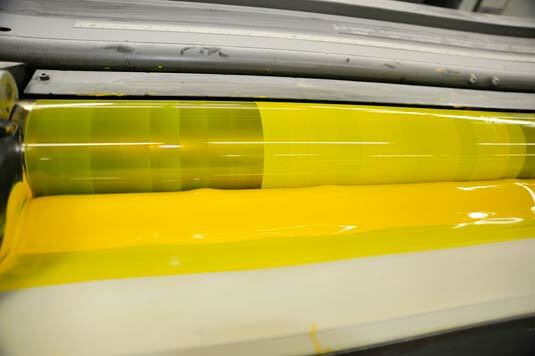 Our lightfast magenta and yellow inks come in small cans, and are manually poured into the respective ink fountains. These large, grey aluminum sheets are the printing plates. Four plates are required to create full colour, one for each of the four colours of ink. 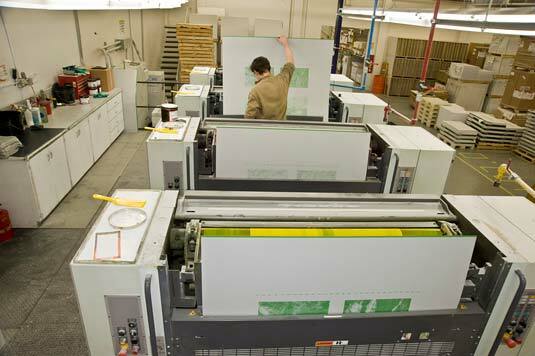 The assistant pressmen installs these printing plates into the press. Once installed and aligned, the plates are fed into the roller train below the ink fountain. Pat and Rosemarie approve another set of four pages. Approvals can take just 20 minutes or extend up to 2.5 hours in length. For those of you who enjoy knowing about the weather... it’s warming up. Today was balmy at just 10°C below zero, and the forecast calls for even warmer weather close to melting. Locals are not excited about this, being that if it does rain, there will be ice, as certainly the -30°C weather is sure to return. This concludes the third report from Pat and Rosemarie at Friesens, in Altona, Manitoba.